I recently had to engage on a very complex deployment, where one of the goals was to utilize the Citrix NetScaler for Exchange 2013 services for a single namespace with Layer 7 and no session affinity. In this scenario, a single namespace is deployed for all the HTTP protocol clients (mail.yourdomain.com). The load balancer is configured to utilize Layer 7, meaning SSL termination occurs and the load balancer and it knows about the target URLs. The NetScaler is also configured to check the health of the target services in the load balancing pool which requires a health probe to be configured on each Exchange virtual directory. With this, as long as the health probes response is healthy, the NetScaler will keep the traffic in the load balancing pool. However, if lets say OWA health probe fails for any reason, the NetScaler will remove the target server(s) from the load balancing pool for future requests. The key to this deployment is to set up Content Switching which enables the NetScaler appliance to direct requests sent to the same Web host to different servers with different content. For example, you can configure the appliance to direct requests for dynamic content (such as URLs with a suffix of .asp, .dll, or .exe) to one server and requests for static content to another server. You can configure the appliance to perform content switching based on TCP/IP headers and payload. 9. Create custom cipher which will get you an A- based on Qualys SSL test and FW and HW version on the NS I am using. Insane! thank you so much! We were working on traditional layer 4 load balancing for Exchange 2013. Was looking at the CTX doc for Exchange 2013 and was unsure how to apply Content Switching. Thank you so much! My LB vServers show as down after I apply them. Monitors show as up. Hey Citrix Guru. Bind the SSL certs to the VIPs and you should be golden. Just updated the post with prerequisites. The Health Check monitors are missing the letter l (lower case L). It should be healthcheck.htm instead of heathcheck.htm. The AutoDiscover service group has the http monitor bound to it instead of the AutoDiscover monitor. Thanks for the feedback will update the content. Also, need to bind SSL certificates to the SSL vServers. And the generic SSL security configs like: disable SSLv3, change ciphers, etc. And redirect for HTTP-to-HTTPS and / to /owa. You just made my day! Works like a charm, I passed the Cipher info to our security team and they agree on the cipher settings. * For NetScaler 10.5 build 57 or newer, enable TLS v1.1 and TLS v1.2. Updated ciphers too. 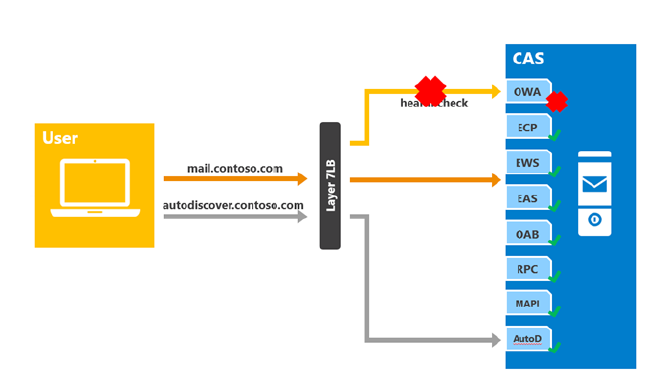 * AAA vServer, SSO to OWA, Traffic policy for OWA logoff, enable auth on vServers. thanks for this..However, any idea why i cannot authenticate via the NS load balancing to exchange? Danson can you be more specific? Authenticate to OWA? Or unable to send to SmartHost? etc? This may be a hint (I am not an Exchange person at all) however check if you are allowing the NS snips in any sort of approved list. All traffic to your backend servers will come from the SNIPs. Hope this helps. i seem to be having problems with persistence, i need to have SSLSESSION configured or i cannot login even to webmail, ECP isnt working even with persistence configured if i have multiple servers in a service group, what am i missing? I have the same problem. I configured OWA to yse SSLSESSION and that seems to work. I guess it should be enabled for ECP too..
Can content switching be used with SSL_Bridge on the services? You can’t use SSL_Bridge with CSW. However you can do is configuring SSL Offloading/CSW with End-to-End Encryption by re-encrypting the clear text data and using secure SSL sessions to communicate with the back-end Web servers. This would however require for you to install the SSL cert on the back end servers as well. Is it possible to block all requests to the activesync url but keep owa functional? I want to keep activesync on, but block it at the netscaler to prevent outside users from accessing it. Thanks for checking my blog. You can achieve that by creating a responder policy and apply it to the OWA VIP. The policy will need to contain something like below. It will need to read the URL that you want to block, then set the action to DROP. I’m having one problem > https://fqdn/EWS/Exchange.asmx doesn’t bring up the EWS service through netscaler. My problem is free busy information is not working at all, if I change ews dir to servername.localdomain free busy works like a charm, but i get cert popups because internal domain cannot be on the cert. Any ideas? I am working on a similar deployment where everything is configured exactly like yours. Did you ever get into such scenario. Any pointers troubleshoot further are greatly appreciated! I had this same issue and corrected by specifying “OAB” all caps instead of “oab” lowercase in the policy. This helped me a lot! But I seem to be experiencing errors for outlook and windows live mail. The send/receive operation gets stuck and doesn’t progress. But this doesnt happen to all users, just a few. What could I be missing? I have a question regarding to Exchange SMTP load balancing. I has configure SMTP_LB on Netscaler and enabled USIP. Because I will see client ip,if the client to communicate to Exchange Server over NS_SMTP_LB but no success. I can just see NS SNIP IP Address. I quest,If I create a responder policy for client ip and bind to Content Switching SMTP Server,maybe I can capture client ip. is it possible? Thank you for your Support. I have a another question regarding to regex response policy. my Customer wants to expand this regex but this syntax is not suitable to netscaler regex syntax. subscriber/document/aa but If the rules does not correspond to subscriber/document/aa (to my currently regex rule) Subscriber/documents/aa regex rules have to contain 8 decimal character and have this character must at least 1 character be otherwise have 422 code reply. Could you help me with this case. maybe I am missing something, but it seesm that exch_cs_vserver_int and ctx_csg_vserver were not defined before they are used? 1. The following two vserver parameters are not defined before they are referenced/used. what are the roles of these vservers? 2. what about pop/imap/smtp protocols? The walkthrough load balance traffic going through https port only. How do you deal with legacy mailboxes in exchange 2010 where they do not support HTTPS/MAPI. Exchange best practices for mixed environments say to allow traffic on MAPI via TCP/443. I cannot do that on my SSL Content switch. Why don’t you do an SSL Bridge for Exchange 2010. You can specify type of connections such as SMTP (gets tricky duo to source IP), RPC, address book services, and CAS.